I don’t ever cook special foods just for picky kids or use food as a reward, but I do let kids help cook (it encourages them to try a wider variety of foods) and let them get creative with it. This recipe was the result of their creativity one time and has been a favorite ever since. 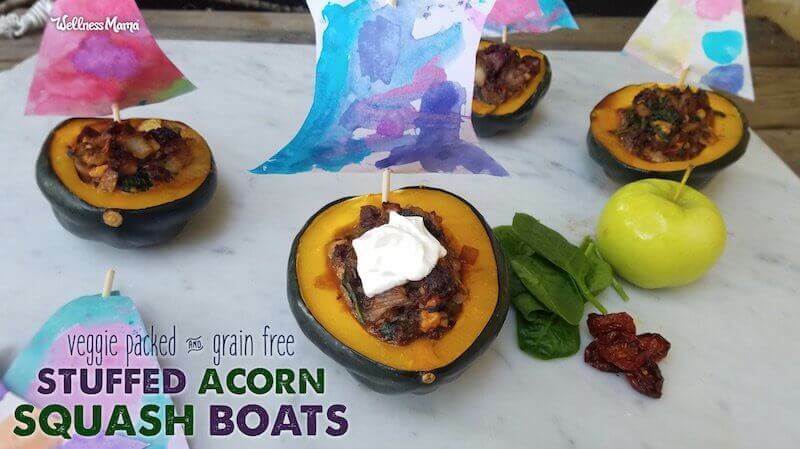 These stuffed acorn squash boats combine healthy proteins and vegetables in a fun presentation. 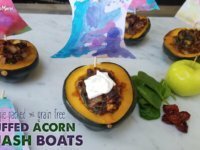 Stuffed Acorn Squash Boats: Healthy Food Made Fun! 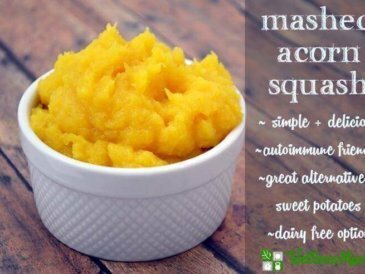 Squash is cheap and easy to find locally this time of year, and what better than getting in more nutrition by serving dinner in a squash instead of on a plate! 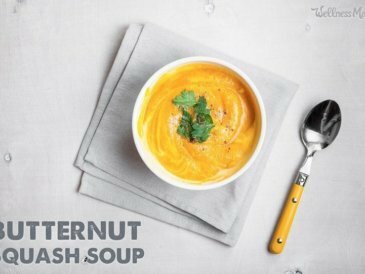 Cut in half, acorn squash is the ideal shape for a personal-sized bowl. To prepare the squash for stuffing in this recipe, first cut each squash in half from top to bottom. Scoop out the seeds, but don’t throw them out! Rinse them off, toss them with salt, spices, and oil, and roast them in the oven for a crunchy, delicious, and healthy snack. 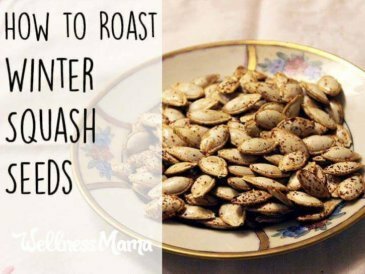 From two acorn squash you’ll get about ¾ cup of roasted seeds, which are full of fiber and magnesium. Here’s the full recipe for roasted winter squash seeds. My recipe uses ground beef or sausage (or a mix) and plenty of vegetables, apple, and spices for a blend of savory and sweet. Sometimes I also add eggs for extra protein and a binder. 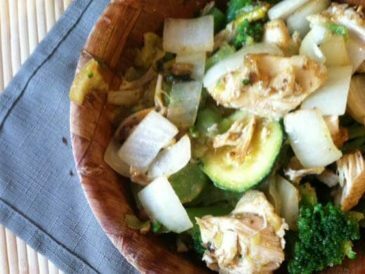 If you’d like to use different veggies or leave out the eggs, go for it! Time-saving tips: Double the filling recipe and freeze half so it’s all ready next time you want to make stuffed squash. 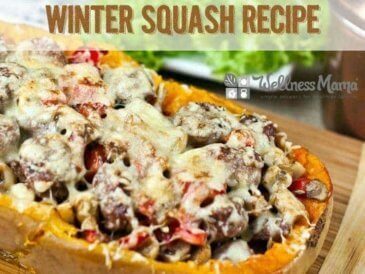 You can also skip baking the squash if you stir-fry the meat filling with frozen cubed butternut squash for the same flavors in a quick weeknight meal. To make sails, simply cut out triangles or quadrilaterals of paper. Then give the kids any sort of decorating supplies such as markers or crayons, watercolor paints, stencils, or stickers. When they’re done, poke small holes in the sails and thread a small shish kebab skewer or large cocktail toothpick through, pointy side down. When the boats come out of the oven, stick in the sail! Next on my list to try: a Thanksgiving-themed squash stuffed with a grain-free stuffing like these. Cut the squash in half and scoop out the seeds. Place the squash cut side down in a large baking dish. Add 1 inch of water to the baking dish and bake for 30 minutes until mostly soft. While the squash is cooking, brown the meat in a large skillet. When cooked, remove from the heat and pour into a large bowl. Chop the onions, apple, and mushrooms. Melt 1 tablespoon of butter or coconut oil in the skillet. Add the chopped vegetables to the skillet and saute 10 minutes. Mix in the garlic, spinach, and spices and cook an additional 2-3 minutes. Chop the sun dried tomatoes and pecans. Remove skillet from the heat and mix in the tomatoes and pecans. Pour the vegetables into the bowl with the meat. Allow to cool about 10 minutes. Add the eggs to the mixture and mix well. Remove the squash from the baking dish and pour out the water. Return the squash to the dish, face up, and stuff the hollows with the meat and vegetables. Return to the oven and cook for an additional 30-40 minutes. Serve alone or topped with Parmesan cheese or sour cream. We also like adding an egg during baking for an over-easy egg on top. If you have leftover filling after stuffing the squash you can either cook and stir it on the stove for extra stuffing to top the squash with when serving, or freeze it and use it next time you make stuffed squash. Feel free to swap out any vegetables you don't like for those you do. For sails use a bamboo skewer as the mast and cut a sail out of a piece of paper. Attach my poking two small holes in the sail and weaving the skewer through. 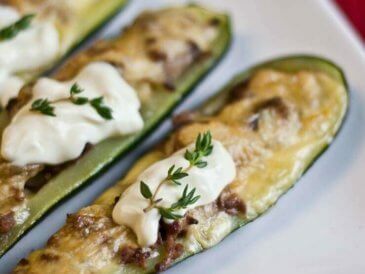 Ever made stuffed squash? Which recipes have you turned into a kid-friendly meal? Share below!